In Japan, there still exists a long list of historical and sacred places. You can explore the same trails where, in ancient times, monks and pilgrims trekked to temples and shrines through sacred forests and villages, and where samurai and emperors travelled between Edo (present-day Tokyo) and Kyoto by foot. 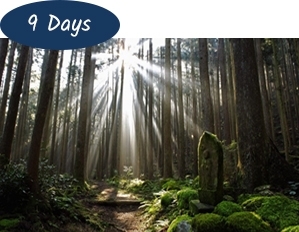 Be transported back into the middle ages of Japan on an historic and pilgrimage walk. Imagine what it was like in the days of samurai and shogun warlords. Mt Koya (Koyasan) is the centre of Shingon Buddhism which is one of the most important sects of Buddhism in Japan. It was founded by Kobo Daishi in 805. 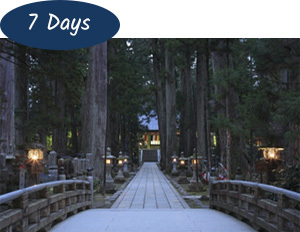 To this day Mt Koya remains as a spiritual retreat, one of the holiest places and the best place in Japan to spend a night in a Shukubo (temple lodging). You will have the opportunity to interact with resident monks and enjoy ‘shojin-ryori’ meals of traditional Buddhist vegetarian cuisine. The Nakasendo is one of Japan’s ancient walkways. The trail connects Kyoto and Tokyo and was the route taken by feudal lords, samurai, merchants and pilgrims. 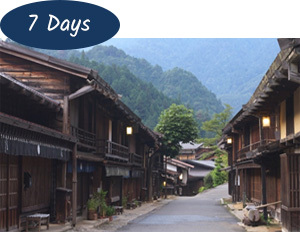 The friendly and atmospheric post towns of Tsumago and Magome, Narai-juku and Kiso-Fukushima provide travellers with traditional accommodation and delicious meals. Step back in time to the Edo period as you venture along the picturesque sections of this ancient track. The Kumano Kodo is an ancient pilgrimage path through the Kumano mountains of the Kii Peninsula. For thousands of years emperors and pilgrims alike have walked this arduous journey to worship at the three Grand Shrines of Hongu Taisha, Hayatama Taisha and Nachi Taisha. Experience the extraordinary spiritual journey of the Kumano Kodo pilgrimage path, enjoy staying at hidden Onsen and feast on the delicious local cuisine!